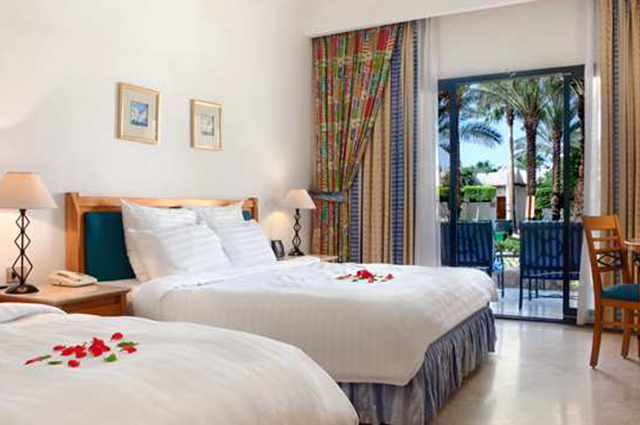 Commanding a central position in Naama Bay, the hotel is enclosed within beautiful landscaped gardens and has the advantage of the longest stretch of sandy beach in he bay. Just a short walk along the promenade will take you to the bustling centre of the bay home to a variety of shops and local nightlife. It is 12 km away from the airport (10min. drive). 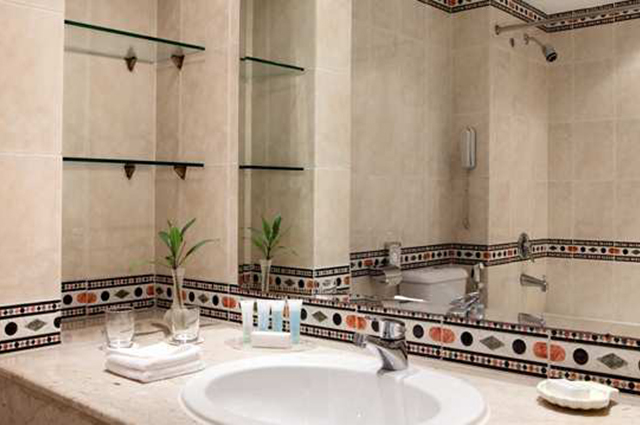 Guest rooms are designed for comfort and privacy and are decorated with style to accommodate all the needs of the guests. 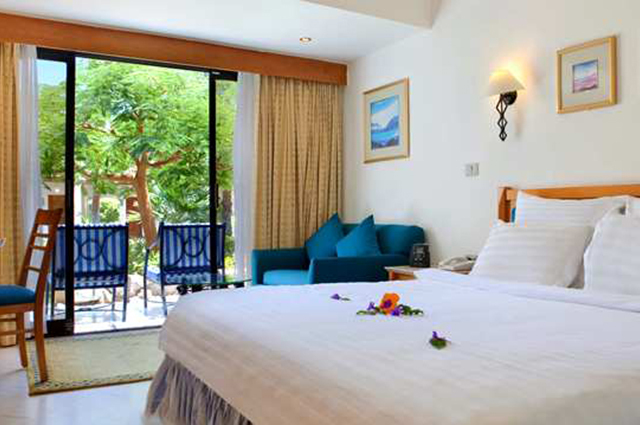 Rooms are tastefully appointed with rooms overlooking either colorful landscaped gardens, or one of the pools or the beach. 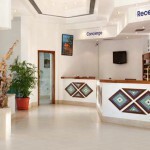 All rooms are well appointed and are modern and comfortable. 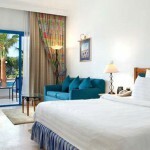 The majority of rooms has garden view and / or pool view and has a balcony or terrace. 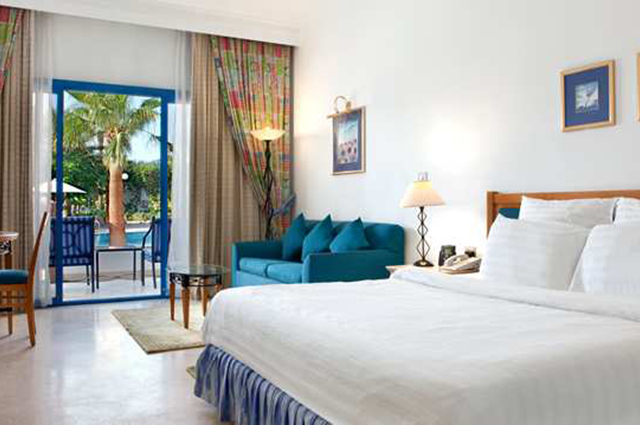 34 rooms are on the front row and have a view of the sea. 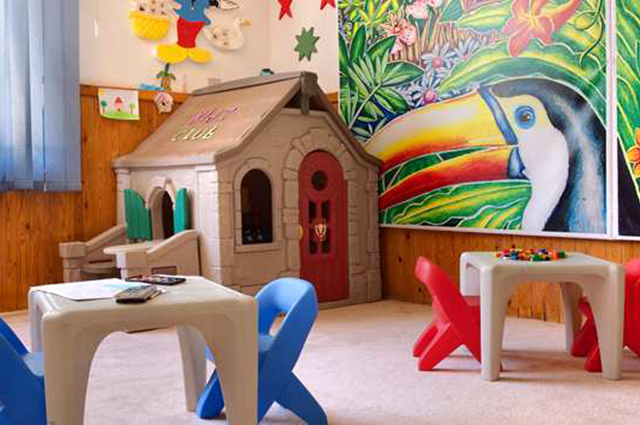 Rooms can accommodate 3 adults or 2 adults and 2 children (third bed is a folding bed or a sofa bed). 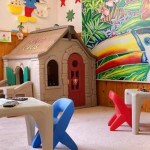 Safety deposit boxes in room – free of charge. 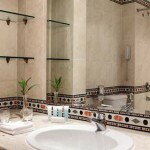 Mini Bar – Every room has its own mini bar that is stocked with a selection of beverages and snacks. The mini bar will be checked daily and restocked. Any items removed from the mini bar will be charged to the room bill. Diving Centre: Sinai Dive Club offering diving packages and courses for both beginners and experienced divers. 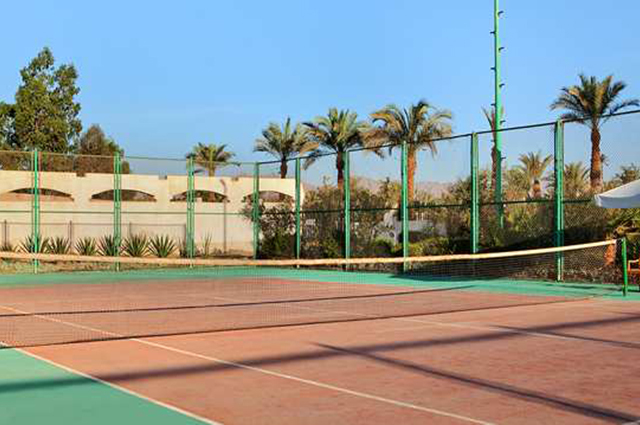 Tennis: 1 outdoor hard ground tennis court is available. Booking is needed. The charge is 50 LE per hour including equipment and lighting. 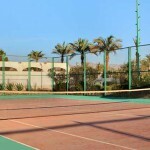 Squash court: 1 Indoor squash court is available. 10 Euro for an hour. Booking is needed. 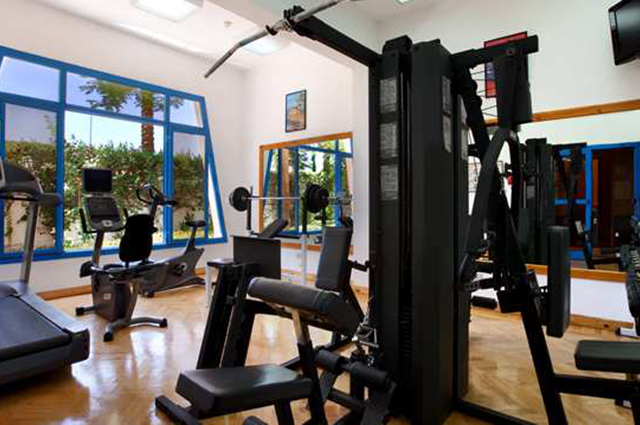 Health Club: Offers a fitness room, massage, body & facial treatments everyday from 10 am to 8pm. 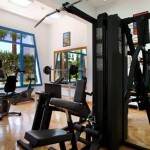 Health Club facilities are at charge! 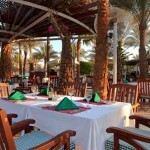 Enjoy a relaxed lunch on the beachfront at this open-air Sharm El Sheikh restaurant, dotted with palm trees. 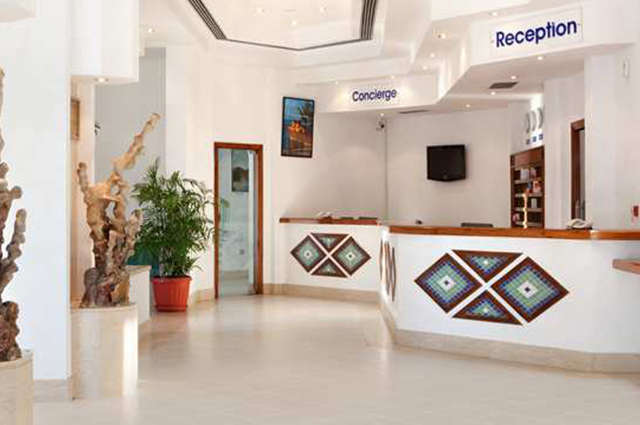 Guests at the Hilton Sharm El Sheikh Fayrouz Resort can order from the à la carte lunch and dinner menus, prepared in the open kitchen. 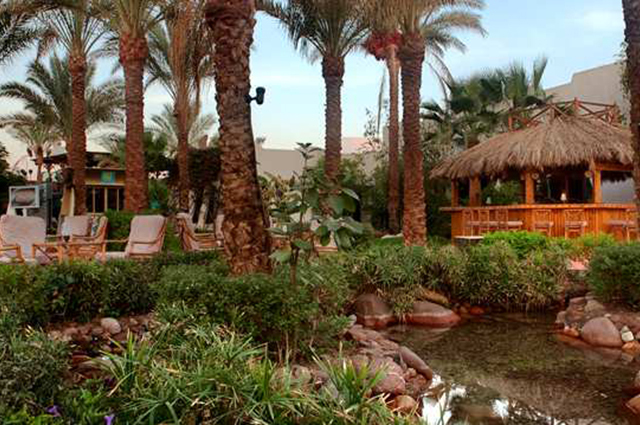 Sip a cold beer in the bamboo seating area surrounded by landscaped gardens at the Hilton Sharm El Sheikh Fayrouz Resort. 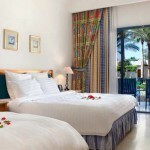 Enjoy views of the beach and promenade at this palm-thatched Sharm El Sheikh bar, serving light snacks and main meals. Try the roasted spring chicken or a club sandwich. Treat yourself to one of our Cuban cigars and a glass of brandy at this open-air Sharm El Sheikh bar overlooking the beach. 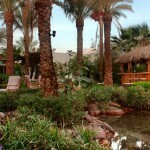 Relax in a bamboo chair and take in the view of the lagoon and the Hilton Sharm El Sheikh Fayrouz Resort’s promenade. Choose from sandwiches, salads and ice creams. A palm roof offers cool shade for guests enjoying cocktails at the swim-up bar at the Hilton Sharm El Sheikh Fayrouz Resort. 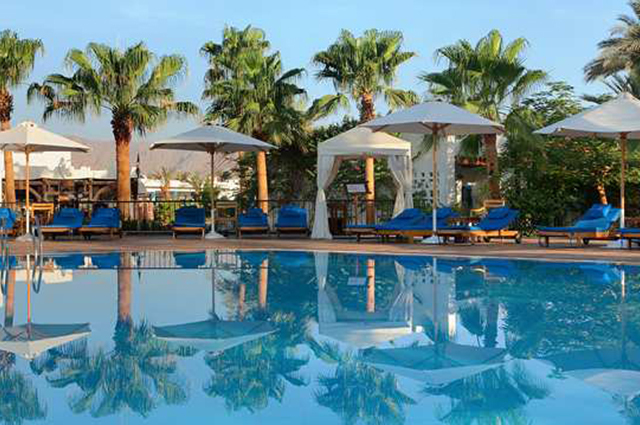 Order a cold beer, sandwiches or a pizza from the poolside service at this Sharm El Sheikh bar, without leaving your lounger. The bar closes at 5:00pm in winter. 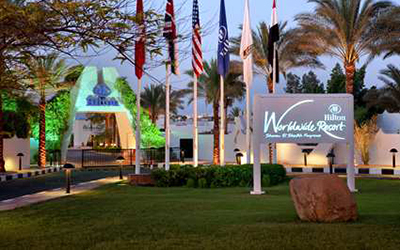 Invite someone special for dinner at this Sharm El Sheikh restaurant, near the beachfront promenade at the Hilton Sharm El Sheikh Fayrouz Resort. 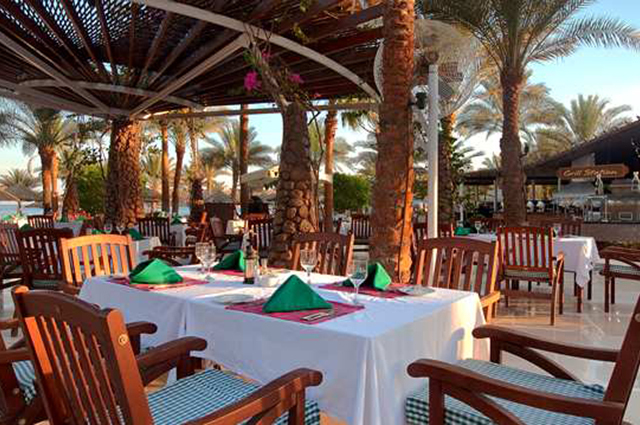 Savor international seafood dishes and fresh Red Sea fish under the stars or enjoy one of the oriental dishes. Enjoy a cocktail on a lounger at this nautical Sharm El Sheikh bar shaped like a boat. 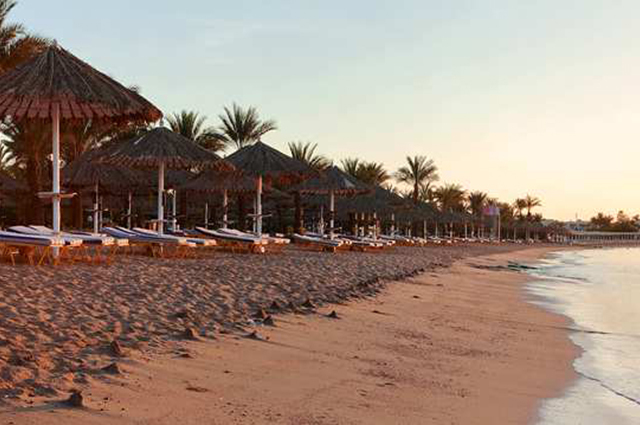 Relax completely on the private beach at the Hilton Sharm El Sheikh Fayrouz Resort, by the Red Sea. Order a sandwich, pizza or Hilton Burger to keep hunger at bay. Closes at 7:00pm in summer. Try a tropicana cocktail at this Sharm El Sheikh bar, decked out like a pirate ship with seafaring navigation equipment and maps. 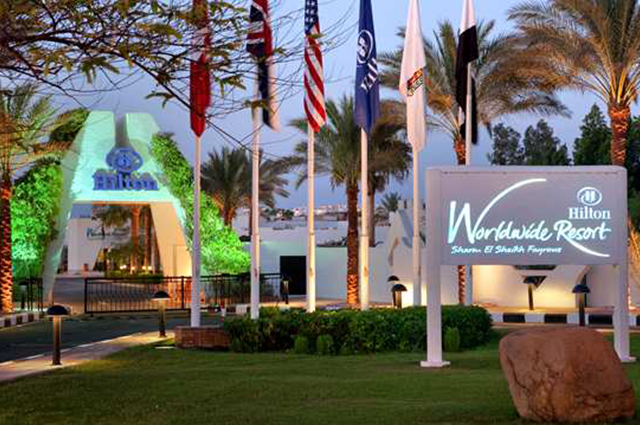 Locals and divers at the Hilton Sharm El Sheikh Fayrouz Resort can order bar snacks like a Pirate’s burger, while enjoying live music or watching TV on 2 plasma screens. With the Red Sea lapping on the shore just yards away, enjoy an intimate candlelit dinner on the private beach at the Hilton Sharm El Sheikh Fayrouz Resort. 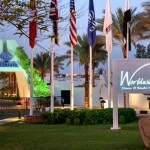 Savor international dishes from the set menu at this romantic Sharm El Sheikh restaurant. Please book at least 24 hours in advance. 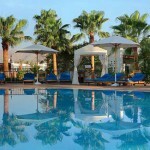 Guests at the Hilton Sharm El Sheikh Fayrouz Resort can savor the Hilton Breakfast buffet in the morning. Later on, take in the stunning views over the beachfront promenade from the outdoor terrace. Enjoy a candlelit dinner and live music at this Sharm El Sheikh restaurant.